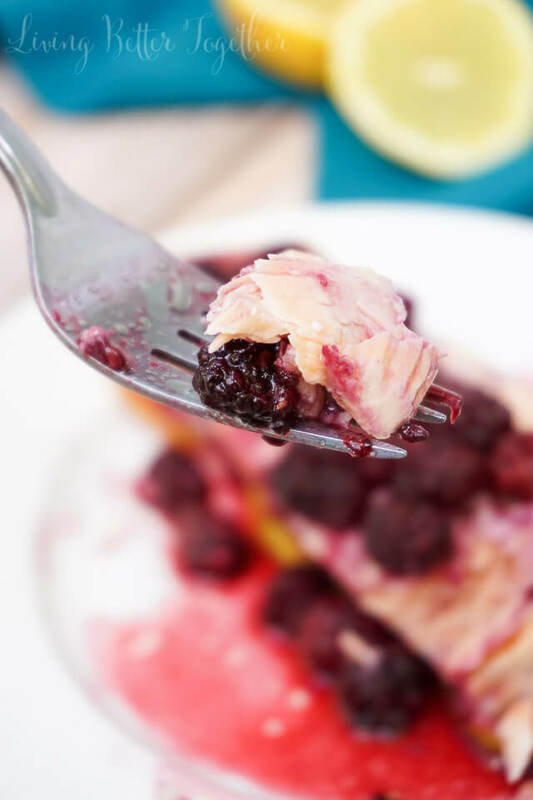 This gorgeous Blackberry Lemon Salmon is a light and flaky dinner recipe that’s baked to perfection in just 30 minutes! It’s loaded with protein and less than 500 calories per serving! 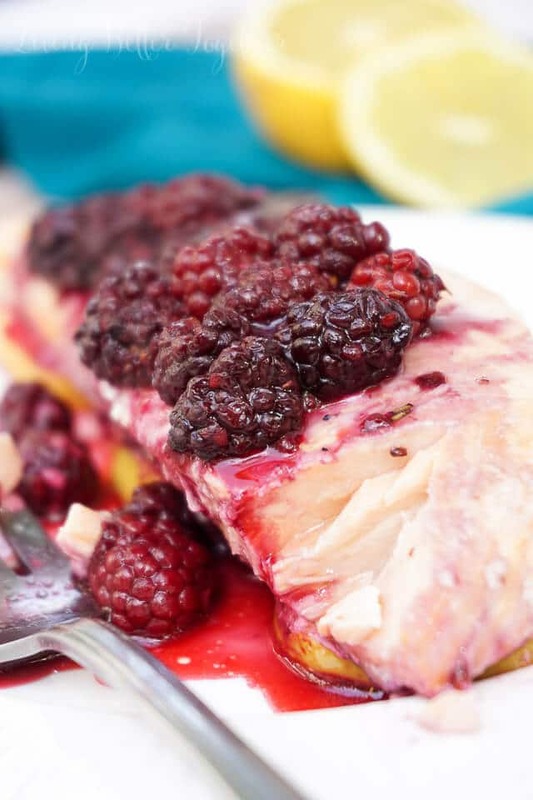 This Blackberry Lemon Salmon is a delicious and light dinner recipe that’s loaded with juicy berries and citrus zing! It’s super easy to cook too! This is one of my favorite seafood recipes and I believe it deserves to shine, especially since it’s super easy (and gorgeous) too! Matt and I aren’t huge seafood fans, but I do like salmon from time to time, so this is the perfect meal for me when Matt isn’t around. So back about 3 or 4 years ago when I was still working at the grocery store, I’d occasionally peek through the magazines when it was dead. I think it was an issue of Better Homes & Gardens that had this recipe for a grilled steak with a blackberry sauce. I just had to try it and when I did, I wasn’t disappointed! A few weeks later I thought to myself, I bet if I added some lemon, that blackberry sauce would be amazing on salmon. Well, it was, and now we’re here. This recipe is so easy, it’s ready in less than 30 minutes and most of that is baking time! I think a lot of people feel like there’s a lot of skill that’s required to cook fish, and in some cases, there is, but not here. We’re going to let the lemons, the tin foil, and the oven does just about all of the work! 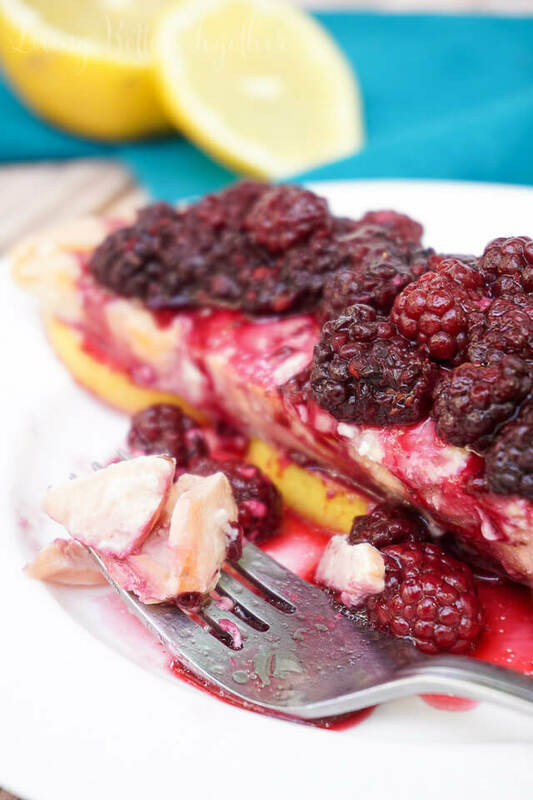 Once the fish is done, you’ll top it with the sauce loaded with shallots and burst blackberries. Pair it with my Ramen Noodle Salad and my Maple Lemonade for a full summer meal! Pin this Salmon Recipe for Later! 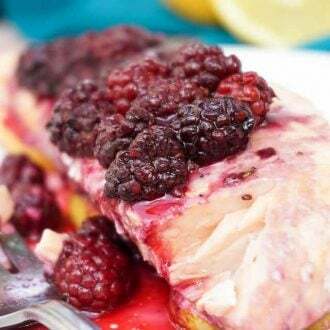 This gorgeous Blackberry Lemon Salmon is a light and flaky dinner recipe that's baked to perfection in just 30 minutes! It's loaded with protein and less than 500 calories per serving! Place two pieces of tin foil on a baking sheet and lay 3 slices of lemon on each in a line, place salmon on top of the row of lemon slices. Drizzle each fillet with olive oil. Gently bring the edges of the foil together and roll down loosely over the salmon and fold up the sides. While Salmon is baking, add vinegar and shallots to medium pot and bring to a simmer until liquid is reduced to half, about 5 minutes. Add blackberries, honey, thyme, water, salt, and pepper to the pot and simmer for about 10 minutes until berries begin to pop and sauce begins to thicken. Remove stems of thyme and pour sauce over baked salmon. 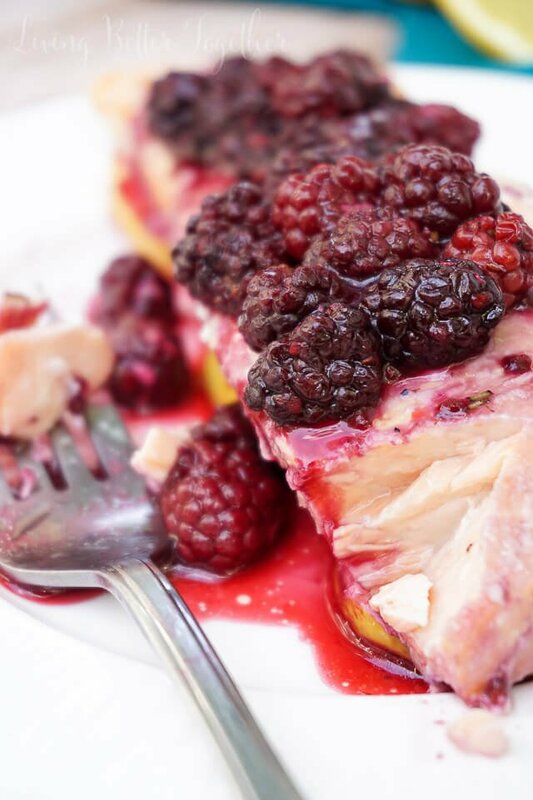 I never would have thought to try combining blackberries with salmon.. but clearly it works. This looks delicious! 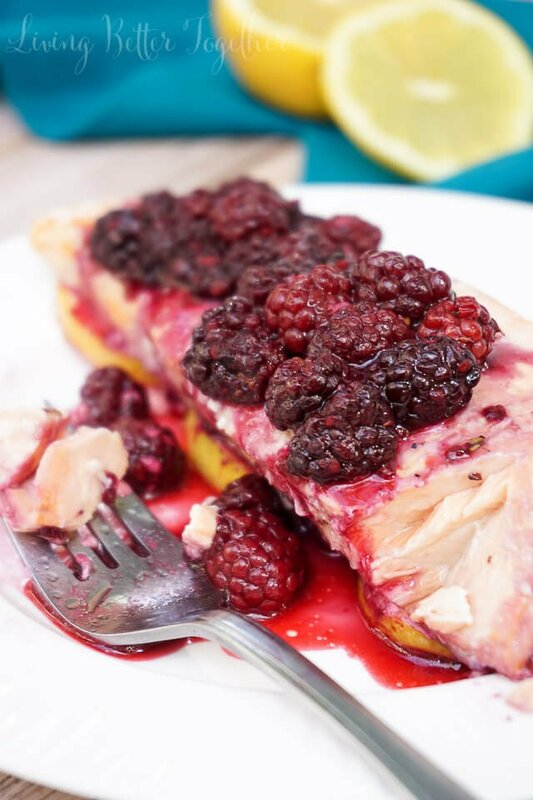 I know, I was hesitant at first, but the blackberries add such a vibrant flavor! Can chicken breast be substituted for the salmon? I do not, repeat not, enjoy salmon. Hi Amy, I’ve only ever made the recipe with salmon. I would think you would need to adjust the chicken baking time but could definitely cover in sauce once it’s baked through.